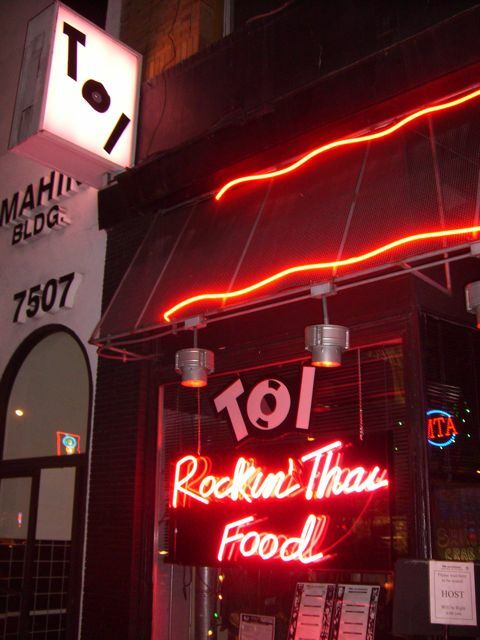 Toi on Sunset – On Sunset Blvd., west of Vine in Hollywood. Why Does Every Deli Have To Be A Famous Deli? After some much needed R & R, Mikey and I are back, giving you more of what you need: Lowered expectations Great food reviews. We had an awesome trip to San Francisco and have a couple good reviews for you guys to sink your teeth into. The good stuff will be coming up later this week. I’ll be the first to admit that today’s review is a bit of a filler. From the title of this post, you’ve probably figured out that this post is going to be about a deli. I’ve been reviewing a lot of these places lately and I’ve noticed that they all have one thing in common. They seem to think they’re famous. Listen to us on Internet Radio Tomorrow! So I have to confess that I actually hit this place last week. I wanted to take a drive on the coast road and I remembered my friend Jack recommending the veggie omelette at Marmalade Cafe. (P.S. – Have fun in China buddy. Let us know about the food) Now, we do have a Marmalade Cafe in Westlake Village, but what’s the fun in going to a place that’s right around the corner when you can take a mini road trip instead. If at first you don’t succeed, try another omelette. For those of you who are just joining us, I have been on an Odyssey of sorts in the past week. I have gone off in search of a decent vegetarian omelette. This may not seem like something worth pursuing, but I would beg to differ. At a minimum, it has at least proven to be an entertaining search, with hair in one omelette (don’t click the link Michelle) and what could best be described as an egg frisbee for omelette #2. Yesterday morning I decided to renew my search for the world’s first good vegetarian omelette. And what better place to go than a place that calls itself a house of omelettes, right? Wrong! In case you missed the first episode in my omelette saga, you can read about it here. The first rule of being a good restaurant: If it’s in the name, it better be good. So I’m a big food TV fan, but I haven’t been watching much lately since Mikey has a good grip on Hell’s Kitchen and Top Chef is in hibernation for now. I did manage to catch the new show called Chopped on NBC. Guess what? They cancelled that shizz yesterday. Oh well, there weren’t any interesting peeps on there anyway. Back to my celebrity chef fetish… I don’t normally act on it by going to their restaurants (except TC Betty’s Grub in LA & Brian’s Oceanaire in SD). I also tend to stay away from the store products that celebs schill for. If you must know, I only buy Paul Newman tomato sauces. Have you ever seen Cool Hand Luke? What a badass that guy was.